Can't get enough of the wild saga of murder suspect and anti-virus pioneer John McAfee? Great, because he just started a blog about his fugitive life on the lam in Belize. Bless you, internet. 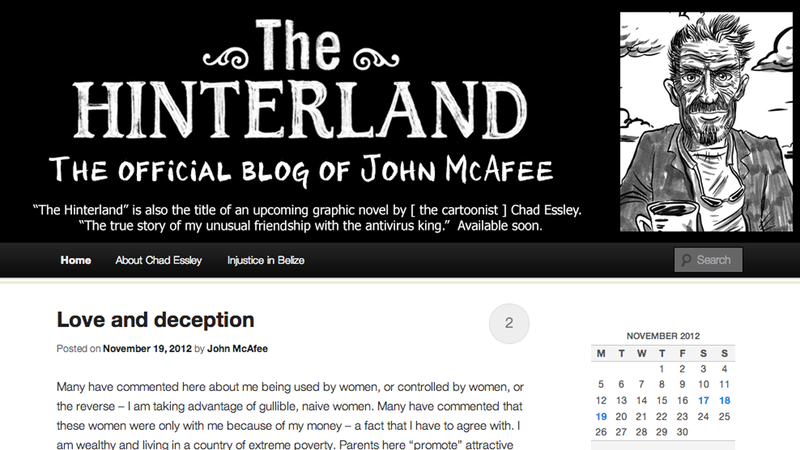 The blog is called the Hinterland, the same name of an upcoming graphic novel about McAfee by Chad Essley. It's just the kind of crazy you'd expect from a guy who surrounded himself with mountains of guns and suspected female assassins. It's natural to wonder if this is the real deal, considering how hard the whole wanted-for-murder aspect of things would make sustaining a blog. But Essley has apparently confirmed its authenticity to ABC News. How did I end up as a murder suspect on the lam? The world press certainly has not helped. Autonomous and self-serving, the press does what it does best – sensationalize. And my character and the recent events of my life have been sensationalized to the max. Take Jeff Wise and his recent posts to Gizmodo as an example. Jeff has made a life work out of smearing my character. Beginning with Fast Company some two odd years ago and continuing non-stop through the present, he has gone beyond the call of journalistic duty to bring my dark side to the attention of the world. You might think that moral duty or a search for the truth has been driving him. But, sadly, this is not the case.